London Green Left Blog: Should Green Writers Boycott Left Foot Forward Over Anti-Semitism Smear Story? Should Green Writers Boycott Left Foot Forward Over Anti-Semitism Smear Story? A post on the website Left Foot Forward claiming that Shahrar Ali, one of the current candidates for the leadership of the Green party, and a former deputy leader, is anti-Semitic has caused outrage among grass root members of the party. The post, which has been through several edits from what was originally posted on 3 August, is a fine example of bad journalism and pretty much a textbook case of fake news. The full video of the speech is now displayed. Highly selective quotations from a speech by Ali were first posted, from a 2009 rally against Israeli military forces attacking the Gaza strip, Operation Cast Lead, where about 1,500 Palestinian civilians were killed, were used. Ali’s speech was aimed at supporters of the Israeli action in western countries, but was twisted by the Left Foot Forward website to imply it was aimed at Jewish people more generally. The story is confected. Mainstream media in the guise of the London Evening Standard, which has been running anti-Semitic themed attacks on the Labour party, amongst other themes, on an almost daily basis for the past couple of years, has now run the story. The paper is edited by former Tory chancellor George Osborne. 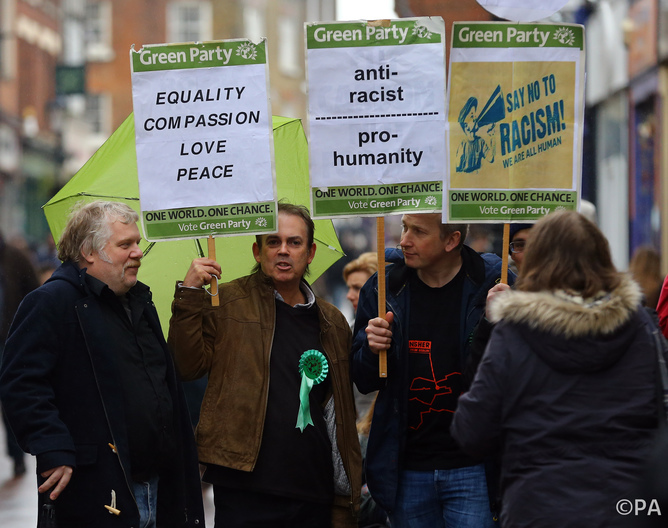 The Left Foot Forward post reports a complaint to the Green party by the Campaign Against Antisemitism, a group that was formed in 2014 to challenge anti-Semitism in the UK, which has frequently complained about Labour party members, including the leader, Jeremy Corbyn. The Green party has said that it is looking into the matter. Quite why a website like Left Foot Forward is spreading a reheated story and video used by the Alt-Right Breitbart news network is something of a mystery to me. What is so Left about spreading right-wing smears and propaganda? Is this what the trade unions funding Left Foot Forward had in mind when setting up the site? You do have to wonder. The piece was written by Left Foot Forward editor, Josiah Mortimer, a Labour party member who supports Corbyn’s leadership, and former Green party member, who became editor about twelve months ago. So, again I’m left wondering why should someone with that kind of politics write such a post? What is the motivation? The story has topical value of course, with voting still open in the Green party elections for leader and other roles until the end of August. The only thing that I can think of is it is a desperate attempt to raise the viewing figures of his website with sensationalist, but inaccurate news stories. Are the numbers down or something? I know Shahrar, and he is a passionate anti-racism campaigner who champions the cause of the oppressed, often the Palestinians, by questioning the role of the Israeli state in such oppression. He is not anti-Semitic, he is anti the terrible human rights record of the state of Israel and its military forces, quite rightly. The Israeli lobby is quick to call people anti-Semitic when Israel is criticised, as a tactic to silence those who oppose their actions, but I am shocked that a left-wing website would support this kind of bullying. Genuine anti-Semitism should not be tolerated, and likening the actions of Israel to the Nazi’s is inaccurate, and given historical events, is grossly insensitive and should be avoided. But that is not case with this story anyway, where Ali did no such thing. Although, you would be forgiven for thinking that it was, by reading Mortimer’s post. Plenty of Green party people have contributed to Left Foot Forward, Caroline Lucas, Jenny Jones, Natalie Bennett and indeed this writer. We should ask ourselves this question though, 'do I want to be associated with a media outlet that peddles fake news like this, and is aimed at smearing the Green party?' Reputation in politics is something that can be tarnished easily and is often judged on who you associate with. It can be difficult to restore. I dont think shahrar is antisemitic. This post completely ignores the awful way that shahrar ali handled all of this. Blocking the journalist and claims he is being bullied. This is shahrars response to all criticism. How would he handle it if he was actually the leader and exposed to proper scrutiny? I've voted for spmeone else based on this experience. I don't tbjnt he's antisemitic but I don't thunmbehes fit to be a leader either. Just tried to unsubscribe from LFF but was timed out - perhaps everyone`s doing it ! Perhaps instead of providing content and audience to Left Foot Forward we should instead consider using the platform provided by our newly revamped online GreenWorld.org.uk site. You should also ask why Peter Tatchell has been using another Left Foot Forward smear story, this time against Palestinian leader Raed Salah, who Theresa May tried to deport 6 years ago and who was released from detention by the Immigration Upper Appeals Tribunal after the 'evidence' that he was antisemitic was found to be forged and fraudulent. Manufactured by the Zionist Community Security Trust. Hi Shahrar. The problem is you put up a post which didn't mention left foot forward and seem to suggest that fellow candidates have attacked you. Please advise. I can't vote for anyone until this is cleared up. Is the Tory Party About to Split in Two?